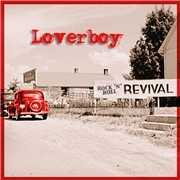 LOVERBOY might not mean a lot to people today, at least not here in Scandinavia, but the States is another place. The Canadian band has sold more than 10 million albums , with a lot of awards in the US, and that is and that is mostly due to four albums released in the first half of the eighties! They are listed as one of the most prosperous touring acts in the world, which of cause prerequisites that they tour in big nations. They have had a short hiatus, but in 2005 they celebrated 25 years together etc. They returned to making albums in 2007, with “Just Getting Started”, and now this one. But this one is not quite new, not since more than half of the songs are old favorites in slightly reworked versions.